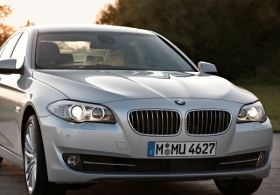 The new 5 series is expected to account for almost one-fifth of BMW brand's unit sales. MUNICH – BMW AG wants its sleeker, larger and more technologically advanced 5 series to recapture the crown as Europe's top-selling medium-premium model. Last year, the 5 series slipped behind the radically restyled new-generation Mercedes-Benz E class, which is available in more variants and is aggressively priced. The E class starts at 39,270 euros ($49,210) in Germany – 680 euros less than the base version of the 5 series. BMW also is counting on the sixth generation of the 5 series, which went on sale in Europe in March and the United States in June, to help defend its position as the world's biggest maker of luxury vehicles. Volkswagen AG's Audi has set a goal of dethroning BMW as the world's No. 1 luxury-car manufacturer by 2015, while Daimler AG's Mercedes-Benz, which BMW passed in 2005 to reach the top spot, plans to take market share in 2010 by growing twice as fast as the industry average. The new 5 series is expected to account for almost one-fifth of BMW brand's unit sales and, combined with the larger 7-series sedan, should continue to provide 50 percent of BMW's worldwide profits, Klaus Draeger, BMW's board member for r&d, told Automotive News Europe sister publication Automotive News earlier this year. "It will remain this way," Draeger said, "because the 5-series segment will grow in the future." Launch date: Europe, March; United States, June. Main competitors: Mercedes E class, Audi A6, Jaguar XJ, Volvo V70/XC70, Lexus LS, Infiniti M.
Base price: 39,950 euros for 520d; 41,900 euros for base gasoline-powered model. The best bits: A new front double-wishbone chassis that improves stability; features that boost fuel economy by up to 15% over the current generation, including brake energy regeneration, 8-speed transmission from ZF, electric power steering and new powerplants; luxury features that have migrated down from the year-old 7-series, such as a head-up display, speed limit sign recognition, lane-change warning, adaptive cruise control, and rear- and side-view cameras. The 5 series also has a parking assist option not available on the 7 series; and safety features such as front seats that are fitted with standard active headrests that provide protection from cervical spine injury in the event of a rear impact.